This is either a great idea or a horrible one… probably a horrible one. 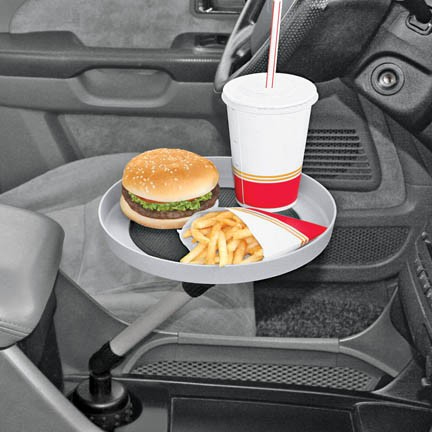 A platter of food at your side while driving can only be a distraction, and considering some of the drivers out there, that cannot be a good thing. However, we all know nobody is pulling over to safely eat a fast food meal anyways, so you gotta put those fries somewhere (before they stick to your insides). Might as well be the Car Swivel Tray. Except, the fact that it takes over the cup holder seems more than a bit dicey. Sure, it features a “non-skid surface”, but that’s not gonna hold back your super-sized cola when you slam on your non-skid brakes. Now I know cola all over your jeans is a distraction–driving or not.